The ambitious campaign saw out-of-home agency Pearl Media convert a shop window into a crime scene that let passers by interact with the display to solve a murder mystery and sign up for alerts from the show via NFC, QR codes and Bluetooth. KILLER APP: Shoppers used their phones to interact with a mock crime scene. Click to enlarge. 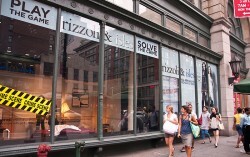 Out-of-home media agency Pearl Media has created an interactive crime-solving storefront to promote the second series of TNT drama Rizzoli & Isles. The New York storefront employs WiFi, Bluetooth and QR codes as well as NFC to enable consumers to interact with the crime scene and to sign up for alerts. The mTag NFC technology used in the campaign was provided by NFC specialist Blue Bite. The interactive crime scene tasks passers by with helping detective Jane Rizzoli and medical examiner Maura Isles solve a murder case. As consumers walk by the 100-foot storefront, they see a three-dimensional crime scene through the windows. This features a taped-off area filled with an array of evidence, including open pill bottles, footprints and fingerprints, as well as a sheeted corpse in the center of the scene. An interactive video wall serves as the ‘investigation headquarters’, allowing consumers to dust for fingerprints, survey the scene of the crime, review DNA tests and view an autopsy report. Window shoppers can also use the interactive display to learn about the motives and whereabouts of three potential suspects and ultimately solve the crime. Throughout the interactive process, the clues revealed by each forensic test are illuminated inside the crime scene. Once the crime is solved, users are rewarded with a photo of themselves with the stars of Rizzoli & Isles, which is then displayed in store window. Consumers can then share their photos with friends via Facebook, directly from the shop window display. The NFC element of the storefront allows pedestrians to place their phone near an identifying marker to interact with the crime scene via their phones, opt-in for a tune in reminder for the show, and get an exclusive mobile game, custom mobile wallpaper and a video trailer of the show. The month long campaign, which has just concluded, saw 4,000 consumers interact with the crime scene using their mobile phones.